This image is best seen at larger scale – click onto to it to see a larger version in a separate window, and click onto that image to enlarge it further – recommended. Mute Swan at Herons Green, Chew Valley Lake, not far south of Bristol; 6 Apr 2015. The bird is preening, busily rearranging its feathers in a flurry of activity that is sending concentric ripples out across the surrounding water. There is another photo of this bird, in very different pose and style, here . Technique: D700 with 70-300 Nikkor lens at 300mm; 200 ISO; -0.3EV; Silver Efex Pro 2, starting at the Low Key 2 preset. Wow, a knock-out! Such elegance and restraint. Thank you, M! Millenials? Had to google it, still not clear, but as long as its on their attic walls do I care what age they are??????? 😉 ………………….. 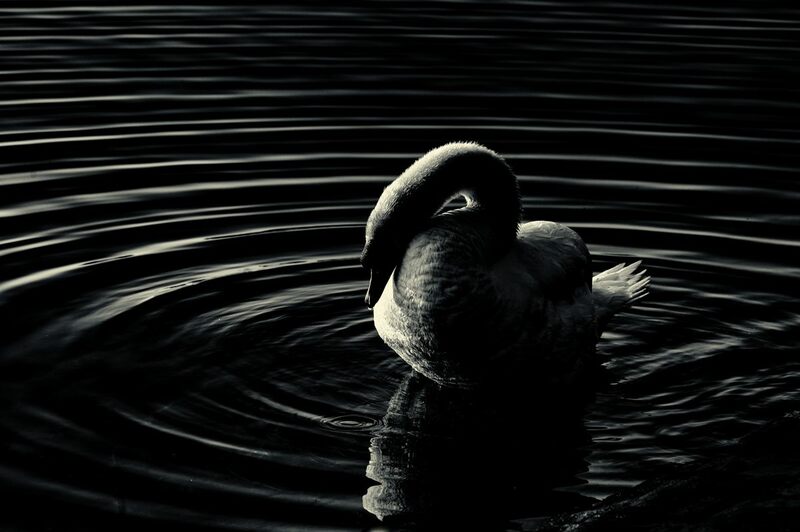 Most unusual picture of a swan, I like it. Such photogenic birds deserve a photographer as good as you. That’s a fabulous image. The Like button thing is a bit odd. I’ve tried to change it… if you have time, could you have another look and see if you can see it now? Thanks! That helps a lot. For one thing it lets me know I’m not going mad(der).